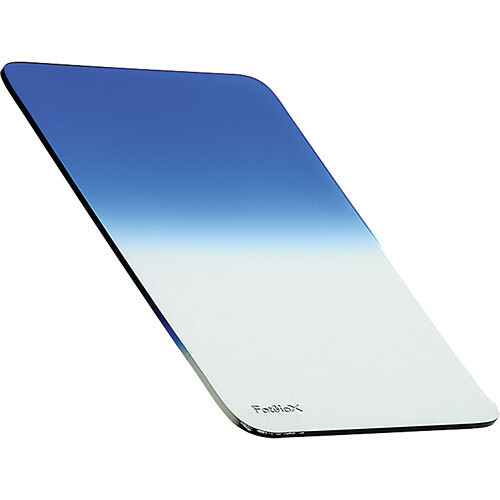 The FotodioX 100 x 133mm Soft-Edge Graduated Blue Sky 0.6 Filter is a filter designed for use with the Cokin Z-Pro series or FotodioX Pro 100mm filter holder systems. It can be used to add blue to a hazy or colorless sky. When used instead of a polarizer filter to enhance the sky within an image, the desired effect can be applied only to the sky, without any unwanted polarization or additional contrast to any part of the image. The filter is densest at the edge and tapers to clear by the middle, with a soft-edged line of transition between the dense and clear areas. This filter has up to a 0.6 density and reduces light from entering a lens by up to two stops. This filter is made of durable, optical resin (CR39) and measures 1.6mm thick. A plastic sleeve is also included with the filter. Box Dimensions (LxWxH) 5.5 x 4.0 x 0.1"